Several times the item is referred to as a "token." This is a basic error. A token is a "Good For" something. They often are used in place of legal coins or as a promotional or gift give away. This piece is strictly a medal. The correct German term for such an item is "Anh�nger," or if you don't have a correct font, "Anhaenger." This means something that one can hang (see the similarity?) somewhere, since the item was made with a loop which probably originally had a small ribbon in it with a pin attached so that one could pin it to a coat, blouse or whatever. 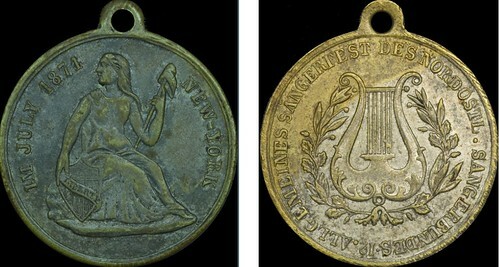 On the "harp" (it's actually a lyre) side of the medal the inscription starts with the number 12 followed by a period (12.). This is a type of shorthand, just the same as 1st, 2nd, 3rd or 12th. I have run across the Liberty Seated design on German items a few times before in the past. Don't remember exactly for what -- medals or counters or maybe even a real token. I might still have one or two somewhere but I would be hard put to find them. 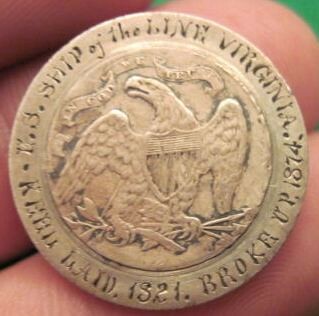 I just acquired on eBay a basically mint state 1873 seated quarter with the reverse edge inscription removed and replaced with an extraordinary engraved naval-related inscription in 1874.